Meetings—our civilization runs on meetings of various types. These gatherings range from the local community meeting or the meetings of Congress to the meetings of civic organizations or governing bodies. Some meetings are productive, and some are not. Achieving a meeting that yields results requires the following of several steps. The most important is to have a goal or objective. An effective plan of action is needed to meet the desired results. The plan usually comes in the form of an agenda. The agenda is not intended to provide the steps that will lead to meeting the desired goal. Instead, the agenda provides guidance to keep the discussion on track and to identify areas that need attention. 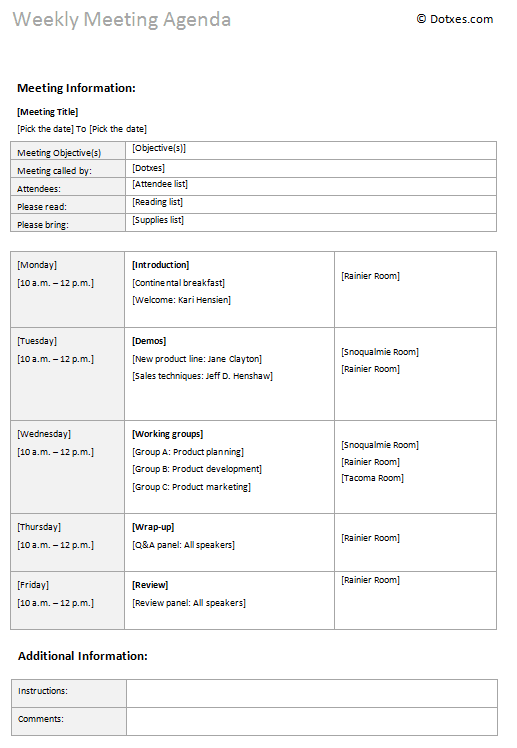 The Weekly Meeting Agenda template provides a guideline for having weekly gatherings. This particular agenda is not for a one-meeting event. Instead, it is intended to lay the foundation for a series of meetings that will take place over the course of a week. The template includes space for the creation of working groups and the particular responsibilities each group will have. The next day will allow time for a wrap-up of the current phase of the issue. The template is not designed to lead a group from idea to implementation in one week. Instead, it is designed to give you the steps for getting started. As the work progresses, the agenda template can be modified in such a manner that the overall progress of the project may be reported in an orderly manner. The template provides a time slot on the final day to review what has been accomplished or is left to complete. The template also provides space for where the various meetings will take place on each day. The meeting agenda template provides space for addition information, such as overall instructions and any concluding comments. This template is the foundation for developing a schedule and assigning responsibilities for an ongoing project. The template is not something cast in stone. It is a document that the user can adjust and alter to fit a particular situation. The Weekly Meeting Agenda template can be a useful tool for many types of groups dealing with a variety of projects or events. The template may be downloaded at the site listed below.